How many of you fell in love with the dog, Barnabas, or the cat, Violet, in Jan Karon’s Mitford Series? I did. I could just picture the large dog pulling the pastor down the streets of Mitford. Or what about the vaporous dog, Friday, from Lisa Wingate’s The Story Keeper? Wasn’t he a hoot! 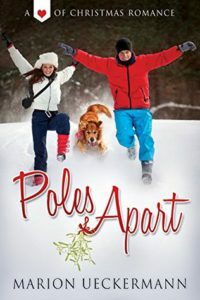 Our own Inspy Romance writer Marion Ueckermann featured two adorable golden retrievers, Mila and Risto, in her Christmas novella called Poles Apart. Pets bring joy to people each day. They make life just a little bit sweeter because they greet you when you come home…snuggle with you when you’re lonely…never say mean things—at least that you understand. I sometimes wonder about one of my cats. Alley can give some wicked looks. Remi is our adorable and brilliant dog; she’s three parts black Lab and one part poodle. Even as a young pup she was perfectly housebroken and quiet, only barking when strangers arrived or when the cats fought (which, sadly, was often). However, during that first year, the Labrador part of her breeding kicked in with obnoxious chewing/teething which destroyed a number of household items including a wingback chair, a twin mattress, and a few of my daughter’s pumps. Everything new is for Sophie. Our cats have varied and strange personalities, and although they’ve been together for many years now, they still don’t get along. All want to be queen, so hissing and snarling are the norm. There’s nothing like waking up to a cat fight on your chest. One cat growls and hides when strangers come. Another jumps in all laps, but will never let you catch her to pet her. And one thinks anything new that comes in her for her to sit on or in. 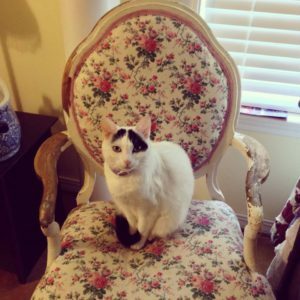 We’re not exactly sure who scratches and desecrates our newly reupholstered chairs, but we love them anyway! Because I usually have a cat sitting on me and Remi lounging nearby, pets seem to end up in my stories. 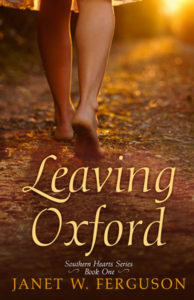 In my first novel, Leaving Oxford, the heroine Sarah Beth is lonely and prays for a friend. She finds a really ugly puppy at her doorstep and assumes that’s God’s answer to the request. The dog Gingie adds a bit of fun to Sarah Beth’s story, but you’ll have to read to find out if that was the only answer she received. 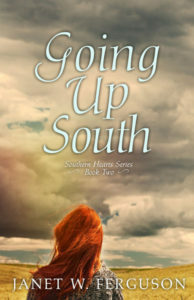 In book 2, Going Up South, a kitten appears at Sarah Beth’s doorstep, too, aptly named Hairy. There’s also a new heroine in that book, Cassie, with a standard poodle. One of my college roommates had one of the large-sized poodles, and I’ve wanted one ever since. They’re pretty expensive, and most of our pets tend to come as free to a good home (they’re never actually free, though, are they? ), so I just wrote the lavish breed into my novels. 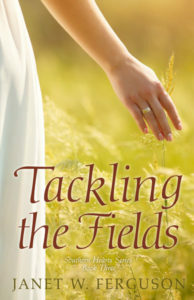 Book 4 features a heroine who is a lonely romance writer with terrible allergies. 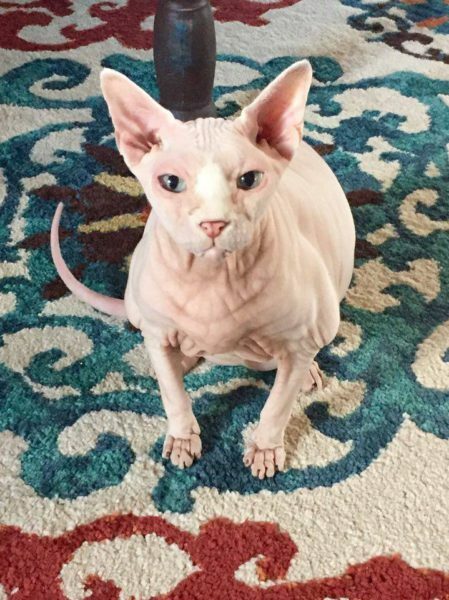 She owns a Sphynx named Mr. Darcy, otherwise known as a hairless cat. Or does Mr. Darcy own her? Don’t laugh at this pic. My sweet friend Susan actually owns this Sphynx who served as my muse. Do you have a pet? Do you like pets in your fiction? Shout out a few of your favorite fictional or real-life pets! Fun post! Pets in stories are fun- they can add loads of humour!! Thanks! I think so, too!! I know my real ones do! In fact my daughter’s cat (I’m visiting her right now) walked across my head last night AND scratched my arm as it fell off the bed, ha! Sadly we no longer have cats but I did recently get my daughter a turtle, she loves that thing and I admit he is cute. Cassandra, So sorry about your cats! My friend’s daughter has a turtle, too, and they love it. They are cute!! And no fur to shed, ha! Hi Janet and welcome to Inspy Romance. Presently I have a 14 year old deaf Sheltie named Penny. She is my shadow. 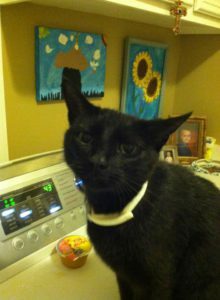 In the past we had a 17 year old cat named Abbey Crabby – she was very vocal in what she wanted and took care of her half brother Smokey, who survived a house fire. We had a Sheltie McBeth, who saved us from a kitchen fire and having the church windows shot out with a BB gun. McBeth was our three sons’ constant companion. In addition we had a hermit crab Hermie and a canary winged BB parrot named Laura that loved to eat the edges of the newspaper. My favorite fictional pet is a pet pigeon in Paper Love by Aubrey Wynne, who also put pets in her historical novels with a Chicago setting. Paper Love is included in the boxed set Christmas Pets and Kisses 2: 12 Sweet Romances and available on Amazon for 99 cents. Hi! Thanks for the welcome!! I know you love your sweet Penny! I used to have a collie and loved her dearly. I think they look alike except for size. My dog Remi could be my shadow, too. That’s a great way to put it. She follows me from room to room. And wow! McBeth sounds like an amazing dog! My roommate way back had a hermit crab. She liked it. It stayed in her room so I didn’t see it much. I love watching videos of birds tearing things up! Strange, I know, ha! That sounds like a great book by Aubrey! I’ll have to check it out!! So happy you chimed in!! Welcome to InspyRomance, Janet! We don’t have any pets of our own, but I’ve adopted our neighbors Havanese. His name is Plato and he’s adorable. He made an appearance in my last WIP. During my college years, I had a cat named Rudy. She was named after my favorite movie. Hi Jill! Thanks for the welcome!! That’s so fun that you love your neighbor’s pet. You reminded me that we kind of did the same thing for our neighbor’s dog. And he was an adorable but slightly ugly three-legged dog. I must give him a place in a book now! Cats are fun and fairly easy companions. I Iove the name Rudy, too! So glad to be a part of this group! I do enjoy pets in stories. I am very allergic to cats and dogs,so the kids had all kinds of other pets as they were growing up. The kids are grown and gone, but we currently have a hermit crab,a lion head rabbit,and fish. We have had anoles,frogs, rabbits, guinea pigs, hamsters, gerbils, parakeets,and water turtles in the past. My daughter and husband went to get computer paper one day and came home with two parakeets. The pet store was next to Staples, was their explanation. When we go to buy pet food now I keep reminding my husband not to bring home any more pets! Diana, So sorry about the allergies. We’ve had them in our family, too, but luckily not to cats and dogs. My son and I both took the shots for years. My character in Blown Together has allergies, and she’s one of my favorite characters! My husband is the one reminding me not to get any more pets, LOL! Blessings, and I’m so happy to get to know you better here at Inspy! We currently share our home with Jeremy Bear, a small tabby who moved in one day, but wouldn’t even stay in the same room as a human for the first six months. He’s now my devoted shadow and is on my lap as I type. And Madam Fluff, a huge long-haired tortoiseshell, who definitely wants to be empress of the world, and has more than the usual dose of torti-tude. There’s also Timba Murgatroyd, a handsome white and black boy who calls nowhere home but divides his time between at least four houses. And though we’re thinking of moving soon so don’t want any more cats, there’s this little terrified white half-grown kitten with the scruffy look of a stray who’s started hanging around and gobbles dry food like she’s starved. Over the years we’ve also had fish, a bunny, and a very loved guinea pig. Oddly, I haven’t written many pets into my stories, though the one I’m working on now features a pet pig! HI Autumn!! Thanks for the warm welcome! I feel better about my cats now! At least we’re not the only ones with fighting felines! Yes, it’s sad they pass on so quickly at times. We dearly miss our collie, Matsie. I adore your cats names :) I had a cat like Timba that had a few other neighbors he visited in search of treats, ha! A pet pig will be a fun story, no doubt! Can’t wait to hear about it!! Love the Mitford series and its pets. I’m a cat person, currently 2 cats. 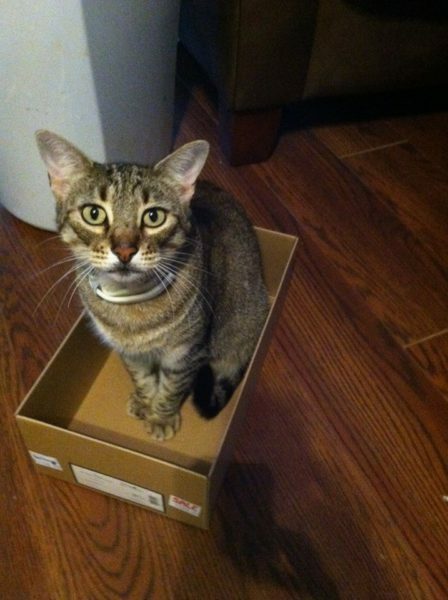 I’ve only had one dog–he was great, but cats rule. Hi! The Mitford pets were fun! I do love cats! Thanks for chiming in!! I do like pets in books. Especially when they are given proper characteristics that add to the story. We had a poodle mix who did not know he was a dog. He lived a long, pampered life. It has been seven years since he’s been gone, I still miss him every day. Health issues have prevented us from getting another. My sister has 2 cats and a dog. They all love me. During my visit to her house this past summer, the kitten decided I was a comfy spot to sleep. She also likes to turn the pages on my kindle. It sounds like you are a great pet aunt!! Welcome to the group! Mitford is our all-time favorite series, especially love Barnabus! We adopted a 12 oz. miniature dachshund in 1995. Her name was Mollee, and she became the queen of the universe! 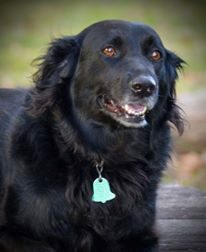 We were blessed to have her for 15+ years and have wonderful memories. We love it when authors include animals in their stories. I read constantly, and my hubby and I listen to audio books every time we get in the car. I am adding your series to my wish list!! Blessings! Awww. Molly sounds sweet. It’s so hard when we lose them. Glad you have great memories though. I hope to get it to audio some time. Still working on that. So sorry about the allergies :( They run in our family, too, but more toward dust and pollen and such. No fun! 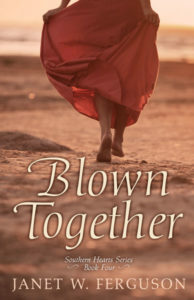 My heroine in Blown Together has terrible allergies and is a bit quirky. I hope readers like her. I loved Lassie and Rin Tin Tin! I had a collie that looked like Lassie. She was wonderful. My cats do tend to smell better than my dog, ha! Hi Janet, and nice to see you at Inspy! I adore adding pets to my books but haven’t done so too much. However, I currently a furry, white, three-year-old Coton de Tulear named Remy (short for Rembrandt; his owner is an art gallery owner) in my upcoming release. I had fun researching breeds. Even though we’ve had dogs in our household, I needed a good breed for a downtown resident (she lives above the gallery which is also helpful). We currently have a cat in our household. Funny thing since my husband used to be one of those people who didn’t care for felines at all. Let’s just leave it at that. :) Then, interestingly enough, HE was the one who rescued our gorgeous cat Brady (we’re New England Patriots fans; Jim grew up in Newport, Rhode Island). He went back and got the cat when a storm was brewing (Brady used to sit on our doorstep a lot). My girls and I came out of the store and Brady was sitting on Jim’s lap in the car. We then went into the pet store, and I told the clerk, “New cat owners here. We’re going to spend some money.” :) I used to be allergic to cats, but I have no problems with our Brady, thank goodness. He’s fit right in, but yes, he rules the downstairs. Aww, my dog’s name is Remi, named for Remmington. Your story sounds great! Can’t wait to hear more about it! I saw that, Janet (Remi), and that’s one reason I had to comment. :) The book is By Grace Draw Near, third in my Wondrous Love Series releasing late this month. Blessings! I was born a cat lover :-) When I was 3, I asked for a cat for Christmas, but my parents thought I was too young for a real cat, so put a stuffed one in my stocking. I told them in no uncertain terms that I wanted a REAL cat! When I was a teen, I prayed whoever I would marry would not be allergic to cats! Thankfully, he isn’t :-) We have had a series of cats throughout our marriage, and the last few pairs have been “best enemies.” So, I always enjoy books with pets in them. Glad my cats aren’t the only ones who are frenemies! Wow! I read the Mitford series as each book was released. I saw the 2nd book was released in February 1996, so the first book must have been released in 1995 – that’s about 21 years ago!!! And I loved the animals in that series. I used to have cats & dogs when we were young. After I came home from college, I became very allergic to their fur, so I can’t have them in our home. We have had 2 crabs once. I enjoy books with or without pets. I can’t believe it’s been that long, and that I can still remember Barnabus. He really made an impact I guess. So sorry about the allergies. My son and I have dealt with that, just not with pets. I was roommates years ago with someone who had hermit crabs. They were interesting. I enjoy books with or without pets, too! Way too much probably, ha! Love Barnabas and Violet! We have a gecko. He’s the perfect pet if you’re not interested in companionship. =) He eats once a week, doesn’t smell, doesn’t make any noise, and doesn’t shed. He’s a cutie (as lizards go). I have loved many animals. My dogs seem to have a bad run and really my cats did too but they were easier for me to care for. I had one cat that lived to be 20 years old. She came to me at a time when I needed a friend. She was also the only cat to survive the fire when my house burned. She was solid black but after the fire she had some grayish and white spots on her and her black foot pads were pink in places. She had the best personality. I grieved quite a lot for her. The only cat I grieved for more was my college cat that I had my last two years in college and then brought home to my parents house for a while. He got very sick and he had to be put down as he couldn’t go and had tumors in his belly. I cried for a week about him. His personality was very special. I love animals in stories. I have read several book with animals that were an integral part of the story. I’m thinking of Joanna Fluke’s Hannah Swensen’s cat and another author whose name and animal characters slip my mind except Tucker was a dogs name. I forget easily these days. Bring on the animal companions. I haven’t heard of Joanna Fluke’s story. I’ll have to check that out! Don’t worry, I’m right there with you on the forgetting. I don’t have any pets but my sister has a dog name chip and he’s adorable. We are petless at the moment, but over the years we’ve had numerous dogs, cats, fish, hamsters, and fish. Hi Merrillee! Well you’ve had quite the collection! I’ve never been good with fish, but I love to look at them. I have a West Highland Terrier named Suzie who is my spoiled little furbaby and each of the kids has an outside cat (4 tom cats). We also have free range chickens which the kids keep naming. I’ve seen a pet snail in the aquarium at my good friend who’s is veterinarian. I guess it’s kind of cool. Aww, I bet Suzie is a cutie!. Love the cats and the chickens. You must have a bit of land at your place? We’re on 10 acres but the chickens like to hang out close to the house, silly things! Beth, That is a bit a land! Sounds wonderful! So funny about the chickens. I have a friend who just loves her chickens. I didn’t know the eggs were different colors form different ones. Yes, we get quite a variety of colors, shapes, and sizes from our small flock. 6-10 eggs a day depending on how hard the kids look for them. We let most of the acreage grow up naturally for wildlife habitat. We often have beautiful whitetail deer bedding down in the tall grass. Once we watched a deer get right up to some of the chickens and check them out. I love to watch the deer romp around and play so close to the house. That’s fun! Like an Easter hunt every day, ha! We have almost three acres, and occasionally see deer or a red fox. That kind of thing. Hi Joelle! You’re right! Children and pets together…tender and emotional! Thanks for chiming in! Love my cat Spooky, she is as you might guess black! She seems to love fiction as much as me=) I often leave the current book I am reading on my bed when I leave in the morning for work, and she loves to sleep on them. Hi Patty! Spooky might look like my kitty named Alley then. She’s a mess, always stirring up trouble. That’s so funny that she sleeps on your books. Maybe she’s trying to be close to you while you’re gone. I love stories that have pets in them! Over the years our family has had a lot of different dogs & cats. Most of them showed up on our property and us kids claimed them. We also have had chickens and a pet duck named waddles. I prefer dogs over cats for myself. Right now we don’t have any pets. I try to spoil the neighbor’s dog and chickens. We live in the country so we never know what will run across the yard. I like to watch the fawns run and chase each other. I also like watching the squirrels and rabbits. I can do without the skunks, opossums and raccoons! We have to watch out for the foxes and coyotes because they like the chickens too much! I would love to watch fawns play. We see deer in the neighborhood, but not like that. I like watching videos of baby fawns. Yeah, I’m not a fan of the others, especially opossums. They give me the heebie jeebies. One night my husband thought our cat was under the porch swing. He reached down to pet it, and saw one. He came inside pretty quick! I am an animal person. I like cats in my life and in the books I read! I do like many different kinds of animals! Linda, I like animals, especially cats, too. My husband tries to keep me away from animal shelters and pet stores, ha! I hope you enjoy the pets in my stories, too!